WASHINGTON — NASA's ambitious plan to snag an asteroid and put it into orbit for astronauts to explore should help put people on Mars, space agency officials said Tuesday (April 29). Called the Asteroid Redirect Mission, NASA's plan involves capturing a relatively small asteroid using a robotic spacecraft and placing it into orbit around the moon where astronauts can visit the asteroid in 2025. While this may sound like a very specific kind of mission, the technology and skills used to get astronauts safely to and from the asteroid will help NASA get to the Red Planet. On the asteroid mission, scientists and engineers will be able to work out some potential problems that astronauts could encounter on a mission to Mars, expected to take place sometime in the 2030s. "We need to hone our skills in the proving ground of space, much like we did with the Mercury and Gemini [missions] leading up to Apollo," Gerstenmaier said. "We built skills. We built techniques. We built operational techniques … We're really preparing ourselves for that ultimate goal toward Mars." NASA officials are still working out the specifics of the asteroid redirect mission. They plan to pick one of two possible asteroid capture missions by December, Michele Gates, senior technical advisor of the Human Exploration and Operations Mission Directorate, said during the forum. In one proposed mission, a robotic spacecraft would snag a small asteroid and park it next to the moon, where astronauts could visit the asteroid. In the other mission profile, the robotic emissary would grab a boulder off a larger asteroid and bring that back to lunar orbit. Both missions would allow humans to visit the asteroid by around 2025 using the Orion space capsule and Space Launch System rocket, two pieces of equipment that could transport astronauts to Mars eventually. "This mission significantly contributes to the extension of human exploration beyond low-Earth orbit [LEO] and into deep space," Gates said. "In fact, we'll go 1,000 times farther than LEO for the first time in 40 years, and for a longer duration in deep space than humans have ever been before." One of the major feats that NASA needs to accomplish before a manned Mars mission is astronaut self-sufficiency while far from Earth. Astronauts on the space station today can speak to mission controllers on Earth in close to real time. That just won't be possible on a lengthy trip to the Red Planet, NASA officials said today. Astronauts sent to sample and explore the asteroid pulled into orbit around the moon won't be able to communicate with Earth in real time, either. This allows ground controllers and spaceflyers to use that asteroid mission as proving ground to test out what a less Earth-dependent mission — like traveling to Mars — could be like. 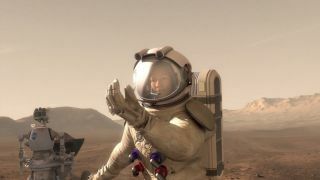 "It won't be easy to go to Mars in any way, shape or form, and we really need to prepare to do that," Gerstenmaier said. "We'll do that preparation first on the [International] Space Station and then push the envelope a little bit further. [We'll] look at the vicinity around the moon where we can have this asteroid redirected into this location to continue to build those skills that are necessary for us to eventually go to Mars."